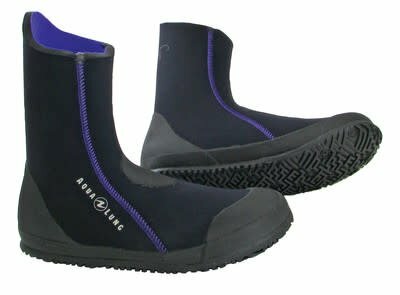 Comfortable and durable 5mm dive boot designed by Women for Women. The Aqua Lung Ellie Ergo 5mm dive boot has been specifically designed by women for women. Its super stretch upper is shaped to accommodate a woman's lower calf and its zipperless entry eliminates water exchange and heat loss which is common on zip-up style boots. The seams have been triple glued and blind-stitched to ensure water tightness. These are not only attractive with a purple inner and piping but are durable with protective toe, instep and heel cap. We have a limited range of sizes available in this boot.